East Kansas is the picture postcard of Christmas. Mountain peaks, wreath-covered storefronts and holiday music streaming into the streets. During the holiday season, ice skating on Miller Pond is the main social outlet for the town. To Olivia Miller, her hometown is the perfect place to live. But the town is dying, and there's only one way to save it. Thomas Baker plans to spend another Christmas alone until he is offered a chance to supervise the construction of a new road. His excitement fades when he finds out the job is in East Kansas, the one place he swore never tp return to. Besides avoiding one man who lives there, Thomas must protect his heart against the young girl who stole it fifteen years ago. According Thomas Baker, a new road through the mountains--and Olivia's pond--is the only way to ease the town's economic struggle. As much as she wants to hate the man hired to build the road and destroy her family’s legacy, she also finds herself inexplicably drawn to him. Olivia tingled with anticipation as she strode across Miller’s field with ice skates dangling from her shoulder. She watched frozen clouds form and then disappear as she breathed in cold air and exhaled. A soft wind wafted down the mountain, shifting black hair across her eyes. She tucked the loose strands into her red knit cap. In spite of Christmas being only three weeks away, and her pre-holiday to-do list stretching long, this moment took precedence over everything else. Around noon, Jake Hanson, East Kansas’s Fire Chief, had declared the pond officially safe for skating. She’d heard the blare of sirens, three short shrieks, broadcasting the event, just as it had every year of her life. Anyone who was able headed to the pond, vying to be first on the ice. And now Olivia was finally on her way. The scent of burning wood laced the air. Already Mr. Carl had the fire going for skaters to warm their frozen hands. The last few yards took her downhill toward the pond. A dozen people occupied the ice, some skating, some sliding on booted feet. “You always make the pond look beautiful. No one can do it quite like you.” Olivia gave a wide grin and continued to one of the wooden benches. She pulled off her heavy boots and tugged on the skates, shivering as her toes settled against the cold leather. “Miss Olivia! Watch me!” Sarah Carter, brown curls peeking from beneath a pink stocking cap, slid across the ice in awkward starts and stops, arms flapping like sticks. A gray-haired couple, arm in arm, moved in synchrony across the frozen pond. Half a dozen boys raced by, seeming to revel in both the speed and the freedom of being released from school. With her boots pushed under the bench, Olivia moved to the ice. The first glide always felt the best, and this year, with consistent cold and the lack of snow, the surface of the pond remained smooth. No need to begin slowly to get her ice-legs; skating was second nature to her. Sashaying back and forth, she coasted across the surface, wanting to be nowhere except where she was. Nothing matched opening day at the pond in East Kansas. Well, almost nothing. The Christmas party at her hotel rivaled ice skating as the town’s most anticipated event. But for now, she would skate. The smile faded. “Hey Mitch.” She didn’t try to hide her lack of enthusiasm. “Shouldn’t you be at work?” Mitch Carter, Sarah’s much older brother, lacked everything Olivia liked about his ten-year-old sister. “The bank can survive a few hours without me.” Mitch paired his pace to hers, his leather bomber jacket hugging a perfect waist. If she looked straight ahead and ignored him, maybe he would move on. The leader of the pack of young boys flew by, his breath coming in hard puffs. He was followed by the second. A third boy passed Mitch, lost his footing, and flailed wildly before landing on the ice. Mitch fell on top of the boy, Olivia on top of Mitch. Mitch’s body felt too warm, and his breath too hot. She tried to look beyond his grinning face to the boy at the bottom of the pile. “Are you all right?” she asked the child. “She’s couldn’t help falling for a handsome man like me,” Mitch said. “David Hunter,” the child mumbled as he jumped to his feet and skated toward his comrades who stood laughing a few yards away. Olivia glared, refusing to respond to his taunt. Yes, he had proposed, flaunting his money and her lack of resources. But she’d made no agreement with him, and no way would she marry him, even though he topped the list of most handsome bachelors in East Kansas. He is a good catch, they’d told her. You need a man around now that your folks are gone, they’d said. Well-meaning townsfolk, all of them; but she saw Mitch more as a know-it-all than a helpmate. She slid off the ice and hobbled to the bench. The best day of the year, ruined. Yes, her parents were dead. Yes, she needed money. But no, she wasn’t desperate enough to marry Mitch Carter. Not yet anyway. Besides, it was Christmas. Maybe Mr. Carl was right, and this year she would get a Christmas miracle. Question 1: 1. Traditions hold a special importance for most families. 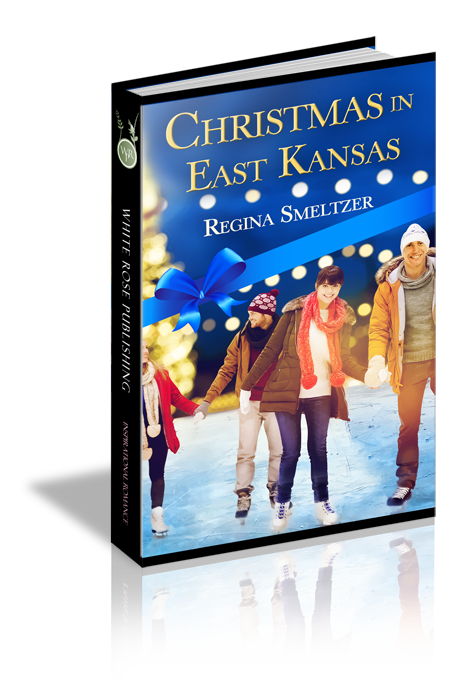 In Christmas in East Kansas, Olivia has vowed to maintain her family’s Christmas traditions regardless the cost. What traditions do you have for the holidays and how hard are these to maintain? Question 2: 1. In Christmas in East Kansas, progress to save the town will destroy the part of the town Olivia holds most precious. She must reconcile her own needs to the good of the town. Have you had times when your needs conflict with that of others? What did you do about it? Question 3: 1. Sometimes people are not who they seem. The public person is not always the private person. Olivia knows there is more to Thomas than he is allowing her to see. When she finally sees who Thomas really is, she is not prepared for the revelation. Have you ever thought you knew someone, only to have them disappoint you in some way? How did you handle this? Question 4: 1. Some of those in East Kansas believe a Christmas miracle happens every year for some deserving person in town. Others say there is no such thing. Knowing God can do anything, how do you feel about Christmas miracles? Do they happen? Question 5: 1. Olivia and Donna have been friends since college. Olivia shares her secret with Donna, and also her fears over the future. Do you have a friend who is there for you no matter what? How do you nurture and maintain that friendship? How would your life be different without that friend? Question 6: 1. Have you ever met someone who made such an impression on you that you cannot forget them? If you met them again and they had changed, how would you reconcile the old friend with the new? Question 7: 1. God tells us to forgive, and yet sometimes the pain is so deep that it seems impossible. Initially, Thomas is unable to forgive Mr. Goodman. How does Thomas and Mr. Goodman manage to overcome their anger against each other? Have you ever been in a situation where you needed to forgive, but found yourself unable? Question 8: 1. The English language seems extensive when trying to learn all the rules, grammar, and vocabulary. And yet, the verbal language often fails to communicate the truth. Several times in Christmas in East Kansas information is miscommunicated, intent misunderstood. Only by really listening can we discover the real message. Have you been the victim of a conversation that was misunderstood? How did you correct the error? Question 9: 1. Environment is such a personal thing. Some like the action of cities while others seek the shelter of smaller towns. Olivia is sure she will not survive in the city. What advice can you give to her, or someone else, who must leave their home and live somewhere else? How could Olivia have made the transition successful? Question 10: 1. In the end, Olivia and Thomas both get their Christmas wishes. Did they get a Christmas miracle?